The latest wine club gift membership from the Original Wine of the Month Club. 12 bottles of hand selected wines in a wine gift case delivered once every three months. (8) red wines and (4) white wines accompanied by our full color newsletter "The Tasting Room-12 bottle Edition"
Each wine is chosen from hundreds tasted each month. The best thing about buying wine by the case from us is that it's all guaranteed! "You never pay for a wine you do not like!" Our wine case gift club is great for that wine lover on your list and a perfect way to stock your own wine cellar. 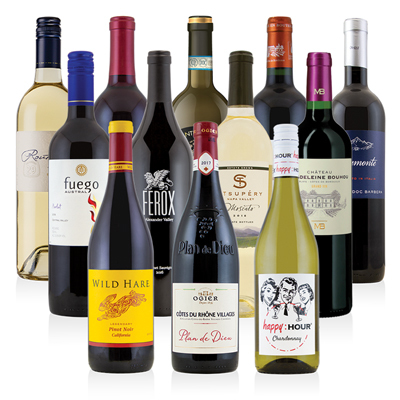 Enjoy top-quality wine by the case, delivered right to your door! I finally got my wines last night! I've been waiting for them ever since my father in law said something big was coming for me in the mail. This is the perfect gift. I opened two bottles so far and they are both fabulous! Wine is the nectar of gods....Wine of the Month Club definitely has some god-worthy wines. will be ordering again. I normally think monthly clubs are a gimmick but then someone close to me signed me up for this one as a congratulatory gift and the first shipment made me reconsider. These wines are just DELICIOUS! I thought I couldn't get delicious wines under $20/bottle. I normally drink grocery store wine when I'm at home and wanting some wine. Nothing special. But these wines from Wine of the Month Club are really impressive, especially for the price. I think I might actually join when my gift subscription is up. This case club gift is a great value for the quality and pricing. I have never tasted bottles this delicious that are priced so low! My sister got me this gift as a wedding present. I was so surprised to receive this box and find wines upon opening. I called my sister to thank her, and she said there are more shipments coming!! My wife was very pleased when she received this shipment for our anniversary. The wines were very good, and pricing was fair. Always fun and interesting to taste the best wines out there. Looking forward to the next shipment as always! It felt like I went wine tasting around the world! I like the variety from Napa Valley and all the international wineries! Every shipment is a surprise! You never know what surprise you're going to get. I love discovering new delicious wines! I am a new wine taster and I love getting a huge variety of the best wines around the world! I like learning and discovering new wines that fit my taste. This is a great deal and great variety!! I am now becoming a wine collector and like showcasing different wines to my friends! They have the best wines every shipment. I felt like I saved a lot of money for getting this bundle. Also, I don't have to risk getting wines that does not taste good. They have a 100% Guarantee on the shipments.